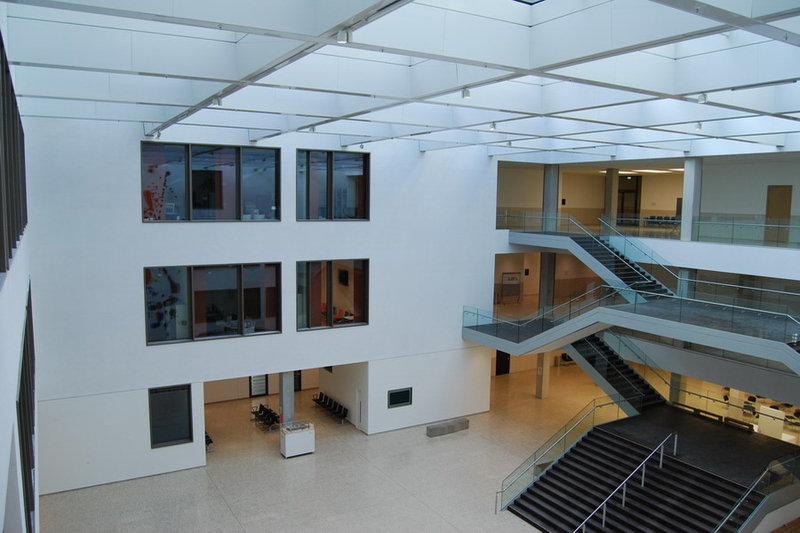 The new building of the regional and local court Duesseldorf became one of the largest justice centres in Germany. The media technology is as modern as the architecture and interior design of the building, which was inaugurated on April 28, 2010. The justice centre includes a total area of 62 000 m². The media technology provides judges, jurors, lawyers, prosecutors, defendants and visitors with the tools that are needed for a modern conduct of a case. Every day, around 3,000 visitors and 950 employees make use of the new rooms at the regional and local court. Among other things, the media equipment is the basis for effective and appropriate trials in a building with 11 training course and conference rooms, 41 single courtrooms, 7 large criminal divisions, 6 small criminal divisions and 2 jury courtrooms. The representation of the electronic case files is only one of many tasks of the media technology. Information about cases is displayed on electronic door plates in the current room and a witness waiting outside the room can be called in via the microphone unit of the judge. Each major courtroom is provided with its own equipment for discussion, audio and video system to ensure a contemporary trial. Nevertheless, the transmission of video and audio signals into other rooms, the networking of the discussions systems via NetRateBus and CobraNet of the different rooms and the control of the room functions such as the opening of the blinds on the windows in time are ensured. The media technology must be operated by the judges and therefore it must be user-friendly and understandable regardless of the complexity of the media technology. Basically, all rooms can exchange video and audio signals and the conference systems in all rooms can communicate with each other, e.g. to provide more room for additional spectators and press representatives in big trials. In addition, certain negotiation participants outside the courtroom can be connected via video or teleconference operation e.g. to avoid victims being are confronted by offenders. To make these network functions available, the audio and video signals are fed into a central control room. The networking of the audio signals are based on the Biamp Audiaflex CM modules via CobraNet. The signal distribution is only one of the seven tasks that the Audiaflex CM can do; they also provide the signal processing. In order to bridge the long cable routes from the MCS-D 200 control unit to the courtrooms, which are combined in the control room, the newly developed CA 4211 optical coupler is used as a solution for the implementation of NetRateBus signals to fibre optic connections with a maximum length of 2 km. This will give 15 major courtrooms (7 large trial chambers, 6 small trial chambers, two jury rooms) their “own” control unit, which can be operated via the iCNS server in the control room and two Crestron touch screens per room (judge, constable in the room). In the two jury rooms the microphone units used are combined to 4 groups for a sound reinforcement via CA 4566 audio interface, AudiaFlex and PA2 amplifier output cards. In this way the judge can hear and see the trial participants speaking simultaneously. The new MCS-D 3041 microphone units for the trial participants and the MCS-D 3073 for judges are provided with an attractive appearance and other advantages: low housing depth for more room to put trial documents on the table, gooseneck microphone mounted sidewards for optimal laptop operation and variable NetRateBus connections on the rear or at the bottom for different placements of the microphone units. The Justice Centre is provided with a total of 454 microphone units of which the judge microphone units are equipped with a programmable function button “4” to call witnesses. The “Free Speech” operation mode has been determined as a standard for the discussion system. This, however, can be changed, when the judge desires a restricted allocation of word. The change can be done directly in the MCS-Digital System without a reboot of the control unit via the Crestron touch screen. In order to prevent that a call for a witness by a judge is not heard, because at the same time another call is made, all MCS-D 3073 microphone units display a flashing LED as an engaged signal. Basically, the Crestron media control system receives all status messages of the control unit or they can be scanned directly. The speaker list of the iCNS can also be requested with the external controller, to mention only some of the functions. 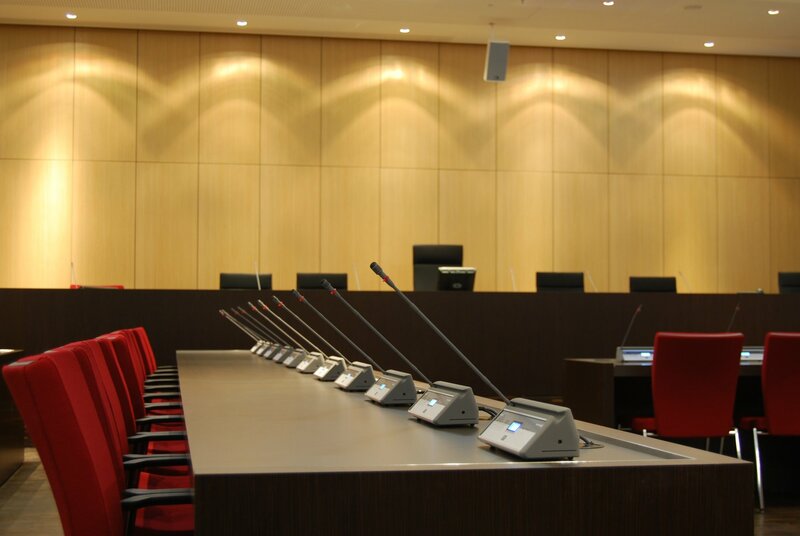 By using the Biamp NPS 1 network microphone unit in the 41 single courtrooms, the call for a witness and the self-locking with currently active call are ensured. The microphone units are directly connected in the CobraNet network and can be controlled via the same network as the audio transmission. If the MCS-Digital system is connected via video conferencing with an interview of the witness, the audio signal is routed via the AEC cards of the AudiaFlex. Due to a fully duplex operation all contributions of the trial participants are heard in a top audio quality without any echo. 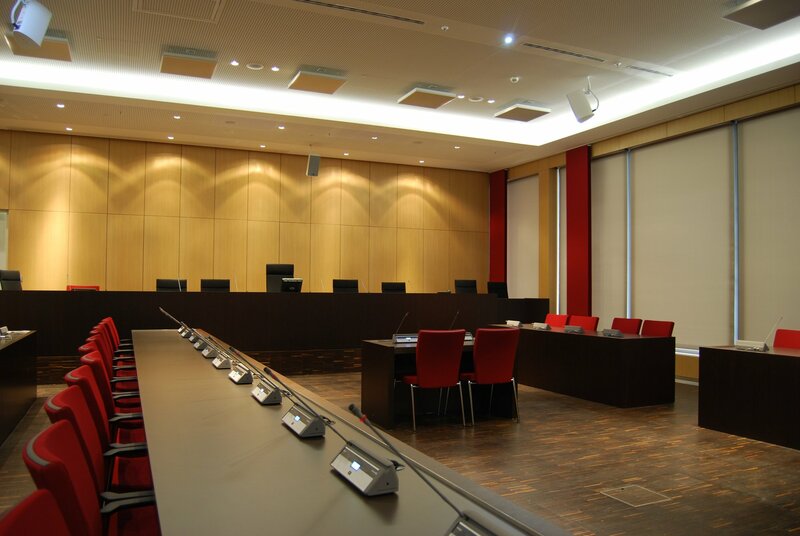 Both, the magnitude and the detailed solutions make the particularities of the media technology installation in the new regional and local court. During the construction phase many extras were implemented into the MCS-D 200 system, which are already used in many other projects.